1Why do I need a safe deposit box? As a private customer, whether you are out of town on vacation or just away from home during the workday, you will have peace of mind knowing that your valuables are being guarded 24/7 in a secure location. As a corporate customer, you will be assured that you have a strong backup outside your office for your important documents or other items in case of fire, theft, or any unforeseen situation. 2What should I store in my safe deposit box? Items that are typically stored are important documents such as property deeds and birth/marriage certificates, physical assets such as jewelry and cash, mementos such as photographs and collectibles, data backup such as hard drives and DVDs, etc. 3What am I not allowed to store in my safe deposit box? Items that you are not allowed to store are any unlawful materials or any liquid, inflammable, illegal substances, drugs, firearms, explosives, perishable goods, living things, or any other banned or hazardous materials. See Clause 4 of your lease agreement for more details. 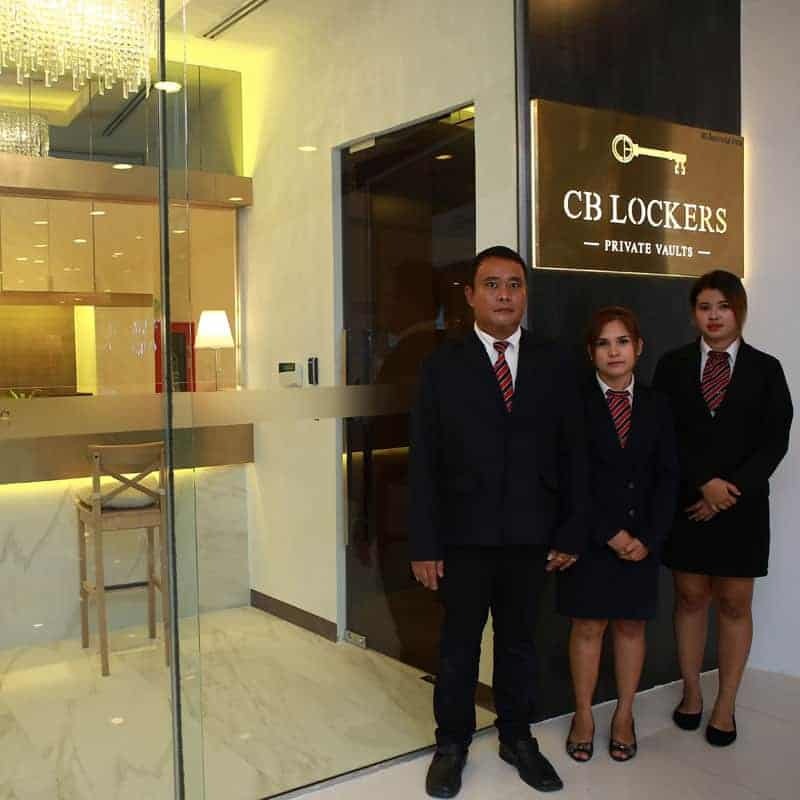 4How can I trust my valuables will be safe with CB Lockers? 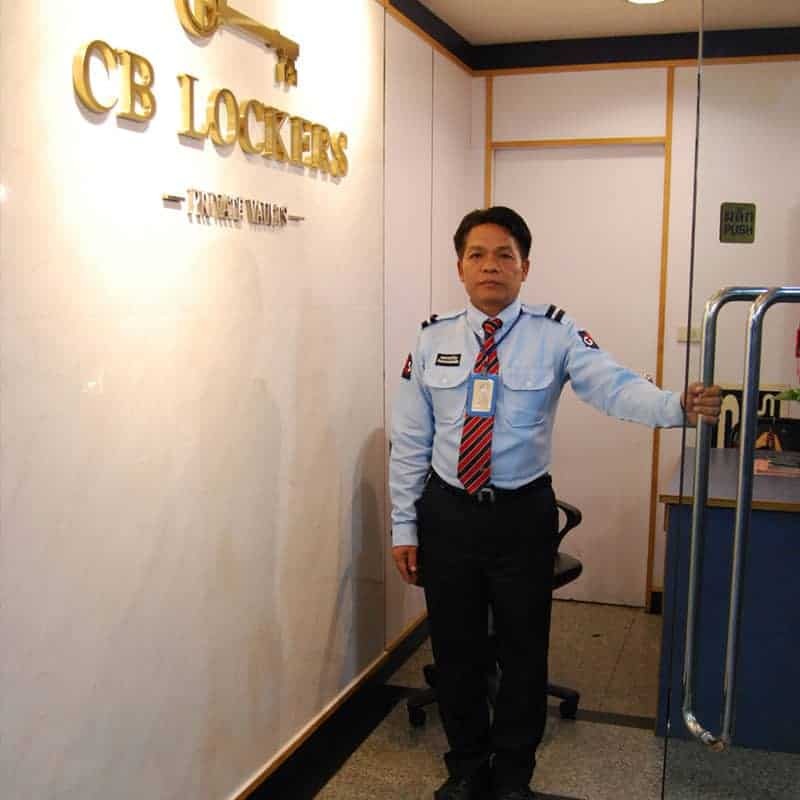 At CB Lockers, security is our top priority. It is not merely something on our checklist; it is a critical part of everything we do. Through a strong partnership with G4S, and having served the jewelry industry in our original location since 2003, we adhere to the highest standards when it comes to protecting your valuables. For specific features, see ‘Why Us’. However, what is equally important and not mentioned elsewhere are our internal procedures that include everything from stringent background checks when hiring personnel, staff training in how to handle emergency situations and how to operate each piece of equipment from fire extinguishers to panic buttons, and always placing security above convenience. 5Are the contents of my safe deposit box insured? 6How can I be sure no one has made copies of my locker keys? We receive the keys sealed from the manufacturer, and only open them in front of you. Every time a client terminates their lease, we return the lock and keys to the manufacturer and they replace them with a new set, which is sealed. In addition, we use Chubb/Rosengrens keys that are U/L certified, and cannot be duplicated by a locksmith. 7I am interested in renting a safe deposit box. Can I go inside and see the vault first? Unfortunately, we only allow customers and authorized personnel to access the vault area. However, we have pictures and all the other necessary information for you to be able to decide which box you would like to rent. 8How much space is there inside each safe deposit box? 9I am a tourist planning to stay in the region for a few months. Can I rent a safe deposit box? Yes! You do not have to be a resident of Thailand in order to rent a box, all you need is a valid passport and visa. 10I am a customer, and my sister is visiting from out of town. Can I bring her to the vault as my guest? Although she is more than welcome to visit, she will have to wait outside. We only allow customers and authorized personnel to access the vault area. 11Should I tell anyone that I have rented a safe deposit box? The best thing to do is to appoint someone as your Power of Attorney (up to 2 additional people per account), and the next best thing if they are not able to come in person to be registered, is to appoint a ‘Nominee’ who can act on your behalf should you be physically/mentally incapacitated. If you are unable to do either of these, you should inform a family member that you have rented a safe box with us so that in case anything happens to you, they will be able to inform us and complete the necessary formalities without delay. 12If CB Lockers closes their business, what will happen to my locker? If we ever have to relocate or close our location, we will give you enough advance notice for you to be able to decide whether you will move with us to an alternate location or prefer to terminate your lease. In such a case, you will be issued a refund on any remaining time on your lease. If we are unable to contact you, we will ensure that the contents of your safe deposit box are properly documented and sealed in the presence of an attorney before placing them in an alternate secure location. 1Why are your prices higher than banks? Unlike banks, we have a facility that is dedicated to a single service. This allows us to have a laser sharp focus on providing you with the best possible experience. We are not interested in upselling auxiliary products and do not require you to have a minimum bank deposit or life insurance in order to be eligible. In addition, we are open 6 days a week with convenient timings, including many bank holidays. When you visit us, you do not have to wait in queues to be able to use our service, and we generally have a much higher availability (unlike many banks which have years of waitlists for larger box sizes). 2Do you have short-term lease options? Yes! We have a short-term lease option for up to 90 days, which is very cost-effective whether you want to rent for a week, month, or the entire 90-day period. Please visit ‘Pricing’ for more details. 3Can I lease a safe deposit box for more than a year? Yes! You can lease your safe deposit box for as long as you like, and we even offer discounts for multiple-year rentals - please visit ‘Pricing’ for more details. The other advantages of a long-term lease are that you do not have to worry about renewals every year, and prices are locked in so that even if the rental rates increase, you will not be charged retroactively. 4Why do you ask for a security deposit? A security deposit of 6,500 baht + VAT is required to cover our costs in case a customer does not terminate their lease and cannot be contacted, and we eventually have to call a locksmith to drill open the lock (after a minimum of 6 months after lease expiry date). However, if you terminate your lease and do not have any outstanding dues with us, this deposit is fully refundable. 5Why is the security deposit the same on short-term and long-term leases? The security deposit is to cover the costs of replacing a lock and/or safe deposit box in case there is a loss/damage and the customer has not paid their rent and cannot be contacted, so this cost remains the same whether it is for a short or long period. In all cases, it is fully refundable when the customer terminates their lease with us. 6Why do I have to pay VAT on my security deposit – isn’t it supposed to be refundable? Yes, when you terminate your lease (provided you do not have any outstanding dues) you will receive a full refund that includes the VAT amount. 7Are there any special promotions or discounts available? From time to time, we may offer promotions for members of certain organizations or through specific advertisement campaigns targeting a particular market segment. If you have heard about us through one of those channels, please let us know when you open a new account with us. For other general promotions, please visit ‘Pricing’ for more details. 1What do I need to open an account? For personal accounts, all you need is a valid passport or Thai ID/driver’s license. For corporate accounts, you need the following: a) Company registration certificate (issued within the last 3 months) b) VAT registration (PP 20) c) Power of Attorney letter authorizing the operation of the locker, signed by a director of the company d) Director’s passport/ID and/or PA’s passport/ID. In all cases, your fingerprints and photos will be taken onsite. 2What will I receive when I open an account? You will receive one access card, 2 keys for your locker (no duplicates can be issued), and a private box to store your valuables in. These must be returned in good condition when you terminate your lease in order to receive the full refund on your security deposit. 1How and when can I access my safe deposit box? You may access your safe deposit box whenever you like, as many times per day as you like (only during working hours). You do not have to inform us in advance. Please remember to bring your personal access card and safe deposit key, without which you will not be able to access your box. 2I have multiple accounts with you. Is there a limit to how many lockers I can open per visit? You are given a unique access card and set of keys for each locker that you rent. You may only access the locker for which you have brought the corresponding access card and keys. If you would like to access multiple lockers during the same visit, you will have to scan each keycard and fingerprint individually in the system before being granted access. 3What happens if I lose my access card or key? If you lose your access card, a new one may be issued immediately at a charge. If you lose your key, you will have to make an appointment so you can be present when we schedule a locksmith to drill the lock and replace it with a new one (in case you have lost both keys) or to simply replace the lock (if you have lost only one key). In both cases you will be issued a set of 2 new keys. You will be responsible for the cost of the replacement lock/keys as per price schedule (please visit ‘Pricing’ for more details) If you are not the owner of the box, we will only be able to proceed with their consent. 4What if I forget to bring my access card? In such cases, we will invoke the manual entry procedure, which is similar to banks. We will require your identification (passport or Thai ID) and signature in order to be verified with our records before you can be granted access. 5What if I forget to bring my locker key? We are sorry, we cannot help you. We do not retain any copy of your keys, and our key will only open one part of the lock. 6What if my fingerprint or face is unable to be identified by the reader? 7What happens if someone steals my access card, my locker keys, makes a mask of my face, chops off my finger, and tries to access my safe deposit box? You have been watching too many movies! But if they did all of that, they still would not be able to get in because our finger scanner has a live finger detector, which means if they just took your fingerprint impression or even your finger for that matter, they would not be able to get in. And of course, we would probably notice that they have a mask on. 8What if I need to get something urgently from my locker outside of working hours? We try to be as convenient as possible, as we are open 6 days a week and even on many public holidays. However, our vaults are armed with a strict time-based lock mechanism that makes it impossible for anyone, including our personnel, to enter outside of working hours. 9Can I give other persons access to my locker? You may assign up to 2 Power of Attorneys, also known as PA1 and PA2, who will be able to operate your locker in your absence. They will have all the same operating rights as you, except for adding or removing a Power of Attorney from your account. They will need to come in with you in order to be registered, and they will need to bring a passport or Thai ID, and their fingerprints and photos will be taken onsite. Please note that you are given only 2 keys when you open your account, and no duplicates can be made. Therefore, whether you are the sole operator or have 1 or 2 other people with such access, it is up to you how and when you want to give others possession of your keys, without which your locker may not be opened. 10As an owner of a box, can I add or remove the assigned Power of Attorney or Nominee whenever I want? We will require you to notify us of this change in writing. Once we receive it, we will stop your assigned PA from accessing your locker and cancel their access card immediately. However, we will not be responsible if they have accessed the locker prior to this. 1How do I renew my lease agreement? Approximately one month before your contract expires, we will send you a reminder to renew your lease. Please renew before your expiry date in order to avoid any late penalties. You may pay for your renewal via a variety of methods including bank transfer, online (please visit ‘Payment’ for more details), or by cash or credit card payment in person. 2What happens if I don’t renew or cancel my lease before the expiry date? Will I be penalized? We will send you a reminder approximately one month before your lease expires. After the expiry date, there will be a late penalty of 5% of your rental fee per 30-day period that your account is overdue (calculated on a daily basis). If you or your representatives do not contact us within 180 days after your account expires, we reserve the right to forcibly gain access and remove the contents of your locker, in which case we will document the contents and relocate them. If you contact us at a later date, you will only be granted access once you have paid all outstanding dues, including late penalties, outstanding rent, and charges incurred by us to access your locker. 3What if CB Lockers claims to have tried to contact me, but I never received any communication? In any case where we have tried to contact you, whether it is to renew your lease, or have reason to believe you have violated the terms of our agreement, or have any other important information to share with you, we will make every effort to contact you based on the contact information that you have provided us with. It is your responsibility to make sure this information is up to date. Whether we contact you via email, post, or phone; once we have made such attempt, we will consider our legal obligation to be fulfilled, whether or not you have successfully received such transmission on your end. 4What if I am not in town when my rent is due? You may pay for your renewal via a variety of methods including bank transfer, online payment, or cash or credit card payment in person (this can be done any time in advance if you will not be there on the day). After your lease has expired, late penalties will be applicable to your account. 5What is the procedure to terminate my lease agreement and when will I receive my deposit refund? You are expected to remove all contents from your box and return it in a clean condition as when you received it. If you have any outstanding dues remaining on your account, you must clear those first. In order to receive a refund of your security deposit, you are also required to return all keys and access cards that you received upon opening your account. You will be required to sign a ‘Lease Termination’ form. If cancellation is before 3pm on a working day (not a bank holiday), you will receive your refund in cash within the same day, otherwise it will be given on the next working day, either in cash or transferred to your local bank account. 6What happens if I lose my key(s) and wish to terminate my lease? Do I still receive a security deposit refund? We will deduct the lost key charges and return the remaining amount of the refund to you. If you lose 1 key, you have to pay 3,500 baht so you still get 3,000 baht back from your security deposit. If you lose 2 keys, you have to pay 4,500 baht so you still get 2,000 baht back in that case too. 7What happens if my rent is overdue and I do not want to renew my lease? In order to gain access to the contents of your locker, you will have to clear all outstanding rental fees and late penalties first. If you know you will be out of town when your rent is due, it is always best to inform us of your situation in advance so that we can find the best payment solution and you can avoid additional charges. 8Do I get a partial refund if I terminate my lease before the expiry date? No, you do not get a refund on the rental fee, but you will get a full refund on your deposit provided you return the box in good condition, including all keys and access cards. 9Can I upgrade to a larger sized box in the middle of my term? No, you cannot upgrade. You can either rent an additional box, or you can cancel your existing lease, for which you will receive a refund for the security deposit, but not for your rental fee. 10Can I move my account to a different branch in the middle of my term? No, each branch operates independently and accounts are not transferrable. If you cancel an existing lease, you will receive a refund for the security deposit, but not for your rental fee. 1The lease agreement has too much fine print. What does it say in plain English? Main section: You are leasing a given locker number for a specific period of days/years for a stated rental charge. If you renew the lease upon expiry, this agreement will also get renewed automatically. Clause 1: You have the right to access your locker at all times during normal working hours, other than a holiday or other emergency. Clause 2: You can allow up to 2 other people to access your locker. Clause 3: You have to give a security deposit of a given amount which will be refunded when you cancel your lease agreement, provided you don’t have any outstanding charges and return both keys. Clause 4: You agree to not use the locker for storing any illegal/harmful/perishable items, and in the case where we have a reason to doubt this or there is an official court order, you will allow us access to inspect the contents and accept full responsibility if you have violated the terms. Of course, we will always try to contact you first before taking any action. Clause 5: You are the only person who has been given the keys to your locker, and we confirm that we do not retain any copies. As such, neither do we have direct access nor can we be held responsible for the contents of your locker, as we do not know what they are. You have not given us anything for safekeeping, you are only renting the locker space from us, so we cannot be held liable for it. Clause 6: In case you have caused any loss or damage to the keys or locker, you will be held responsible for the costs. Clause 7: You agree to take care of the locker as your own property, and shall allow inspection if necessary. Clause 8: If you end the lease early or violate the contract, you will not get any refund for the unused part of the term. If we terminate the lease for any other reason, you will receive a refund on the unused portion. If you do not have any outstanding dues, you will receive the security deposit in full. Clause 9: When your lease has expired and you have not paid the renewal fees, we will deny you access to your locker. You will be charged the rental fee for the overdue period plus a late penalty of 5% of the rental per every 30 days that you are late. For a 90-day lease, if your account is 60 days overdue OR for a 1-year lease if your account is 180 days overdue, we have the right to forcibly gain access to your locker, clear the contents, and attempt to recover your outstanding balance by disposing off your assets. We cannot be held liable for any such action. Clause 10: In case you are incapacitated, disappear, or die, CB Lockers has the right to protect you by preventing access to your locker. If you are the sole operator of your locker, your surviving relative must produce legal evidence that they have been given control of your estate in order to gain access. Clause 11: If you violate the terms of the contract or there is a court order, you will be given 30 days to clear the contents and return the locker to us, or else we will proceed as per clause 9. Clause 12: If we need to relocate your locker, we will give you at least 30 days prior notice. If you do not agree, we will refund you the unused portion of your rental term. Clause 13: We will use e-mail as our default method of communication, unless you have specified otherwise. It is your responsibility to inform us of any change in contact information. Clause 14: We will try our best to keep your information private and confidential. However, we will have to cooperate with any law/government agency if required by the law. Clause 15: If you violate this contract, you are responsible for any related damages/costs incurred by us. Clause 16: Although we do our best to provide the highest level of protection, we cannot be held responsible for acts of Nature, acts of God, or other disasters such as fire, riots, terrorism, armed robbery, or any other acts beyond our reasonable contract. Clause 17: If we amend any of the terms of this agreement, we will give you at least 30 days’ written notice. Clause 18: If there is a 3rd party at fault, we cannot be held responsible and such a matter must be pursued directly with them. Clause 19: You confirm the amount paid upon signing this lease and accept the receipt of 2 keys for which we have not retained any copies. 2Do government or law enforcement agencies have the right to access my locker without my permission? As per our strict client confidentiality protocol, we will protect your rights to the best of our ability. The only case where we will be required to comply is when there is a court order or warrant issued in the safe deposit box owner's name. As we do not have direct access to your box nor any knowledge of its contents, we will request the authorities to contact you first, and we will also do the same. 3Does CB Lockers have the right to access my locker without my permission? We value your privacy. However, if there is strong reason for us to believe that you are storing something in your locker that violates the terms of our agreement, we will make every effort to contact you immediately. Only in the event that you cannot be reached or are unavailable to address the situation will we be forced to take further action. 3 possible scenarios are: a) You have stored perishables which are rotting inside your locker. b) A government authority has come to us with a court order in your name ordering the contents of your locker to be inspected. C) Your account has been expired for over 180 days, and we have been unable to make any contact with you. In all cases, our first priority is to try to contact you and inform you about the situation. We will not take further action unless we have no other choice. Even in the event that we are forced to open and inspect the contents of your box, the process will be clearly documented on paper and on camera with witnesses present, and the contents will be sealed and kept securely in an alternate location if possible. 4What happens if I become physically or mentally incapacitated? If you have assigned a Power of Attorney, they retain operating rights to your locker. 5What happens if I die? The court-appointed Administrator of your estate must bring the appropriate legal documents (death certificate, court orders including Letter of Administration, will (if applicable) and passport copies of the deceased, the Administrator, and inheritor). If these documents are from overseas, they must be translated, certified, and deemed valid in a Thai court of law. The Thai embassy in your home country may be able to assist in this matter. 1What documents are required to open a new account? 2What documents are required to appoint a Power of Attorney? 3What documents are required for a court-appointed Administrator to access a deceased Lessee’s locker? *All copies must be shown along with the originals. If not from Thailand, the documents above must be translated, certified, and deemed valid in a Thai court of law.